WOLCOTT — Naugatuck High junior quarterback Jay Mezzo walked away from his first varsity start Friday understanding the Greyhounds have plenty of work to do offensively, but he also felt comfort after opening the season with a 14-0 road win over Wolcott. 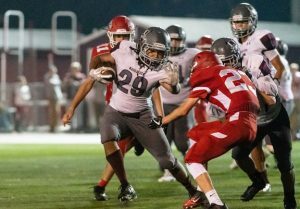 The Naugy defense allowed Wolcott only 123 yards of offense as the Greyhounds’ defensive line of Herve Tshibamba, Tyrell Allen and Mike Amankwah consistently disrupted the Eagles’ offense, then let their teammates swarm to the ball. The offense did enough as Mezzo finished the game 7-of-17 passing for 117 yards with one touchdown pass and one interception. His 33-yard pass to Paul Marsh with 47 seconds to play in the first half gave the Greyhounds a 7-0 lead. Late in the third quarter, the defense stopped Wolcott on a fourth-and-2 play at midfield, and the offense capitalized. Runs of 14 yards by Doreon Chapman and 15 yards by Anderson set up Chapman for a 6-yard touchdown 11 seconds into the fourth. Two possessions later, Wolcott had the ball at the Naugy 17, but Zack Koslosky recovered a fumble. On the next play, Mezzo connected with Koslosky on a 33-yard pass and the Greyhounds were back in control. Gattison finished with a team-high 69 yards rushing on nine carries while Chapman had 43 on four carries.